While attending University in Guelph, Ontario, newlyweds Mike and Connie spent many hours searching for the perfect place. Along their travels they came across an old school house for sale just north of Arthur. The basement of the school house, “which we accessed through the sliding doors, and we’re not saying how”, was 2000 square feet. It was constructed with 6×6 ceilings and an enormous octopus furnace. The house, complete with the bell tower seemed like the coolest place to live and work. The only problem; it was too remote. This was the early ’70’s, the hippy era. It was ’72 when the film ‘Alice’s Restaurant’ came out starring Arlo Cuthery. The characters in the film lived in a school house, where they worked on pottery upstairs and had to drag all their pieces downstairs to finish. To Mike and Connie, this seemed like a pretty dumb idea. 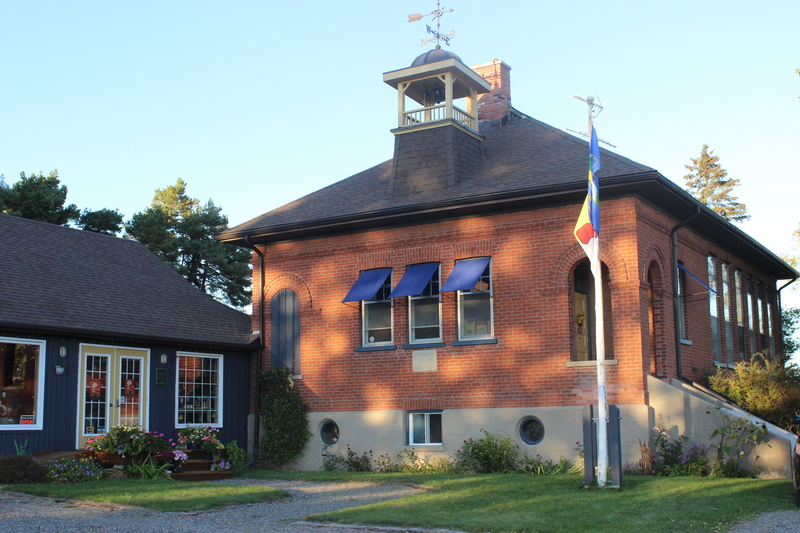 With the Canadian version of the film ‘This is it’, along came the idea that one day they would find the perfect school house, (complete with a workshop in the basement). Mike and Connie remembered missing out on a school house in the Beaver Valley north of Kimberly, by just a few weeks. It sold for $28,000. ‘Cains Corners’ was actually posted in the Globe and Mail. It stated, “school house plus 4 acres in Stayner, Ontario”. Take off a few zeros from today’s price and it was ‘hippy affordable’. Oddly Connie’s Mom and Dad were in Cobalt visiting during one of the festivals where Mike and Connie were selling their wares. That weekend they made the most money they had ever made at one time. Nana and Papa looked after the girls, while Mike and Connie went to view the school house. “We made arrangements with the Kellys to meet us, but we had already gone through the place before they arrived, and we’re not saying how we did that either, but we just knew it was the place for us”. Mike recalls driving past the school house around the age of 15. “My old man had a secret way from Richmond Hill by way of Maple to Thornbury. Drive Hwy #10 to Angus and on. We used to call the area “dog patch”. It was meant to be. They were asking for $5000 down and since Connie’s folks weren’t too keen on them living in the north, they had given them a cheque ahead of time. The Kelly’s took back the mortgage with the $5000 down. As young potters with a growing family there wasn’t much money to keep up the house. At the time, Sunnidale Township had a program designed to help those that earned under a certain amount. It was a low percentage loan. This helped improve the basement windows, install fluorescents in the basement, upgrade the electrical to 200 amps and shingle the roof. Around the same time, Mike went to see the clerk Ted Hannah and inquired whether he should be paying a business tax. The clerk told him “they would get to that but we didn’t want to scare you away”. These were the days when you met up with your mayor at the dump. Mike and Connie’s first meeting with the bank manager went fairly smooth. Daughters Ivy and Ana, put their CN International truck into gear and rolled it back into traffic. They’ll never know who it was, but the bank employees never forgot those “rubby dub” potters. As with any older home, it is a deep well of expenses that never ends. Mike and Connie have been obliged to keep it up, it’s an investment, but furthermore it is a place of history and community memories. The list of people that have contributed to keeping the school house fit and updated is endless. 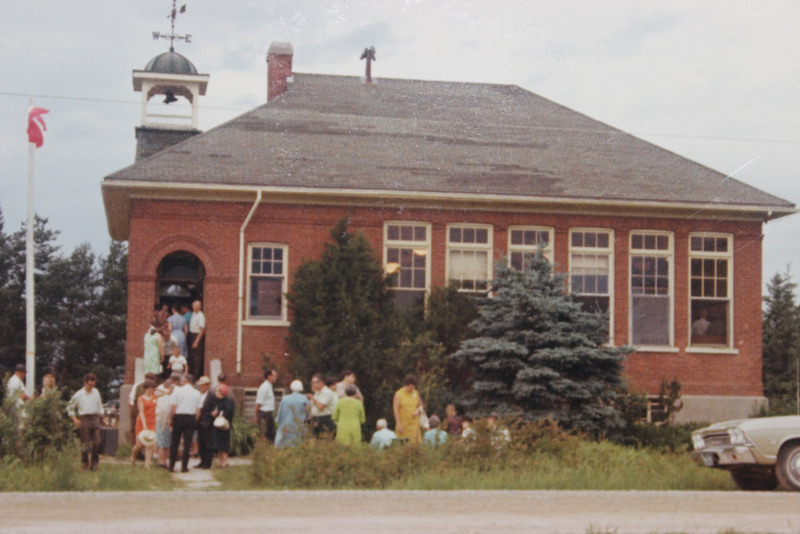 The Cains Corners School House was a school for 55 years, owned privately for 10. Mike and Connie, along with their family, have lived and worked there for another 35 years. It is a landmark that continues to be as valuable to the community now as it was back then. 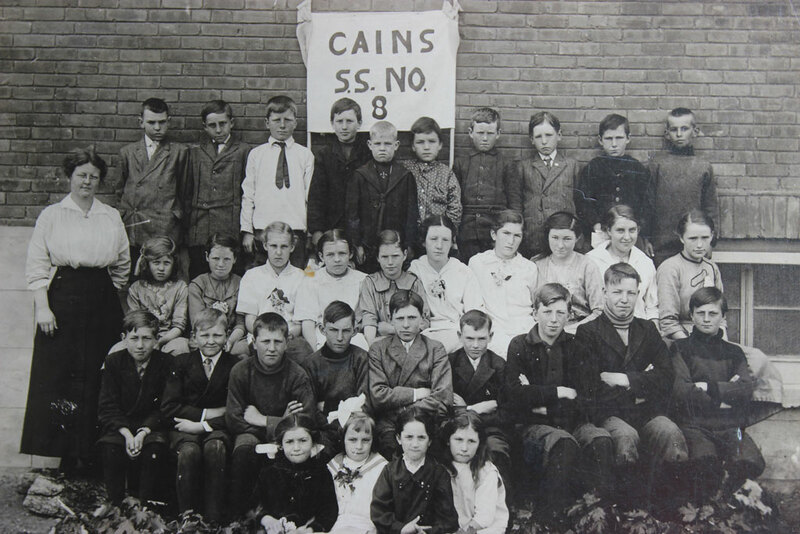 “It is our dream that the Cains Corners School House remains integral to the landscape and always provides you with a beacon of light on your travels”.